Who doesn’t like strawberries!? And what a delight to wake up in the morning to pick a handful of your very own fruit to add to your breakfast. Leave behind the guilt of yet another plastic packaging tray and embrace the joy of growing your own produce with these tips and tricks for growing your own strawberries at home. Strawberries are best planted when temperatures are between 10 and 20 degrees Celcius. Bare-rooted runners are the most affordable way of purchasing plants and you will be able to find a wider selection of varieties this way too. If you are planting later in the season, purchase plants as they are more established. You will find plants for sale at most times of the year. Healthy plants produce the tastiest fruit and strawberries are prone to developing some nasty viruses. Rotating planting beds is another way of reducing this risk. Avoid planting your strawberries in beds where potatoes, tomatoes, caspicums or eggplants have recently grown. Find a sunny location for your plants. The heat and light will help produce sweet and flavoursome fruit. To help your soil drain try mounding your planting beds or if you are planting in a container choose a premium potting mix and ensure your container has at least one drainage hole. Strawberries like a slightly acidic soil of around 6 to 6.5. Ideally about a month before planting dig in plenty of compost and well-rotted animal manure. Water fortnightly with seaweed solution to improve the vigor of your plants. 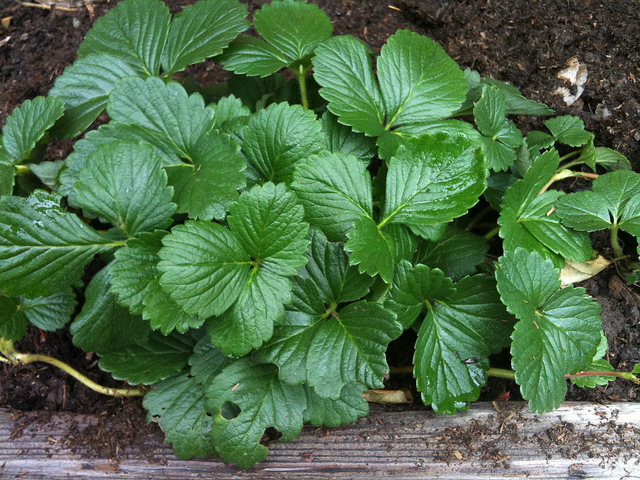 Plant around 30 centimetres apart and remove at least some of the runners growing out from your original plants otherwise your strawberry bed with get overcrowded. This will make your plants less productive and your fruit smaller and sour. The runners are usually produced over summer and can be used to propagate new plants if you wish. Keep plants well-watered, especially when they are settling in, during dry summers and when fruiting but try to avoid watering the leaves. Instead water the soil at the base of the plant. Keep your plant beds well mulched to retain moisture, control weeds and prevent your fruit from contacting the soil. Some straw will do the trick, hence the name “straw” berry. For the best flavour pick your berries when they are fully ripe on a sunny afternoon. To avoid damaging fruit when harvesting, use scissors and leave a small piece of stem attached. After fruiting has finished, tidy up your plants by giving them a hard prune. Use secateurs to snip of a majority of the leaves. Some people even use their lawn mower to do this! Your plants will become underproductive after this time. Ideally replace them with new virus-free stock. For a continuous supply plant 30% new plants each year. Known as the lollies of the strawberry world, these fruit may be small but they are sweet and intensely flavoured. Grow them from seed in spring and summer. Choose from red, yellow or white fruit. Try out these tips and you’ll enjoy a delicious and bountiful harvest!